This piece from the Telegraph shows there’s a burgeoning men’s knitting movement in Britain. A yarn store with a 20% male clientele! It’s meditative, it appeals to geeks, it’s mathematical, and it’s for guys who are confident in their masculinity. All good messages. This is a great pattern to use up bits of sock yarn. You can make socks for all kinds of small electronics just by adjusting the number of knit stitches on each side. Using Judy’s Magic Cast-On for Toe-Up Socks, cast on 18 stitches onto each needle. There are now 20 stitches on each needle. Row 3: k7, p2, C4F, p2, k7 and repeat on second needle. Rows 4–8: k7, p2, k4, p2, k7 on each needle. Row 9: cable, and continue with pattern, cabling every six rows. Continue until the sock is 13.5 cm long. Knit k1 p1 rib stitch for 1 cm and bind off. M1L Make one left-leaning stitch, by picking up the bar between stitches on the left needle from front to back, and knitting through the back of the loop to twist the stitch. C4F Slip two stitches onto a cable needle, let them hang to the front, k2, then knit the stitches off the cable needle. As part of their exhibition of male textile artists, Man Made, the Dowse Art Gallery in Lower Hutt has invited me and any keen male knitters to come along to a knitting circle in the gallery itself, on Sunday November 24th, 1–3 pm. Any chaps who are interested can come along and learn to cast on. There’ll be some more-experienced knitting guys there to help out, as well as snacks. Here’s more information; pick up some nice yarn at Holland Road on your way and get a 10% discount. At the last Knitting For Blokes session, we had a camera crew, and appeared the next night on Campbell Live! I was really pleased with the tone they took – none of the “look at the bizarre men” you sometimes get. It was pretty exhausting, running round helping lots of beginners cast on and answering questions under the hot lights, so I don’t look my freshest. Big ups to the Make Café for hosting and coordinating everything – I hope they get plenty of publicity out of it. The Christchurch Press on 25 Sept had a nice story about me and the Make Café classes. Although they misattributed a quote, and at first claimed, in the headline, that knitting was “not just about picking up chicks”, I liked the photo. The next day I was on the radio explaining why chaps should be allowed to knit hats if they want to: ten minute audio here. And now I’m told a TV crew is coming next week to film real live men actually knitting. I’m running knitting classes at Make, a cool craft store/cafe/teaching space in Riccarton. Guys are welcome to come along for one or more sessions—if you sign up for three, you get a starter kit with yarn needles, needle gauge, and other goodies. You’ll learn to knit a dishcloth, hats, scarves, a dinky iPhone sock, and how to make cable needles out of No. 8 wire. Alumni will be entitled to join the completely-meaningless League of Knitting Gentlemen on Ravelry. Here’s the schedule with materials needed/supplied. 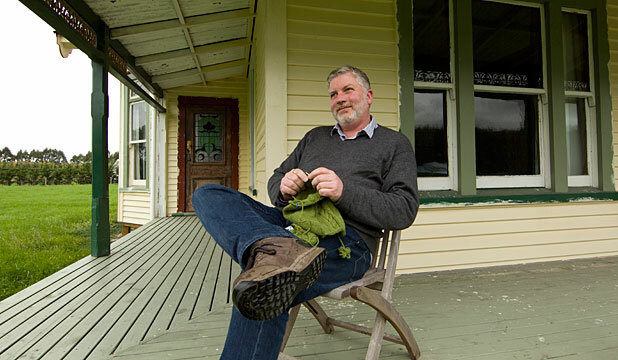 I was staying in the Hutt Valley recently for a month, and asked Tash Barneveld at the Holland Road Yarn Store if there was a knitting group for men anywhere. There wasn’t, so we ended up launching Man Made, six evening sessions for men who wanted to learn to knit. We got quite a bit of publicity: a cover story in the Hutt Valley News, pieces in the Dom Post and Fishhead. There were only 12 spaces, because that’s all the shop could hold, and they sold out in a few days. Half the guys paid extra to do all six sessions (we charged $10 an evening). The attendees were just from the Hutt; if we’d run it in Wellington city we could have gotten twice the numbers easily.